Famous as the first Englishman to have seen the buffalo, in 1684 the London-born Kelsey was apprenticed to the Hudson's Bay Company and sailed to York Factory, its fur trade post on the west coast of Hudson Bay. The Hudson's Bay Company's strategy was to build posts at the mouths of rivers flowing into the bay and there await the Indians who came down the rivers from the interior. To encourage such a trade, the company required employees who were skilled in Indian languages and willing to travel inland. As these proved hard to find, company directors were happy to learn that "the boy Henry Kelsey [was] a very active lad delighting much in Indians' company, being never better pleased than when he is traveling amongst them." It is not likely that Kelsey's route will ever be definitely established. There is a well-argued case that he traveled south of what is now the town of Hudson Bay, Saskatchewan, as far as the Yorkton area and ventured into both the Beaver and Touchwood Hills. What is beyond doubt is that he was the first European to see the Northern Plains and to witness a buffalo hunt, conducted on foot by people among whom the horse had yet to be introduced. Kelsey did reach the Naywatame, although he was unable to persuade them to suit the interests of the Hudson's Bay Company by concentrating less on making war and more on hunting beaver. Nonetheless, he returned to York Factory in the summer of 1692 "with a good Fleet of Indians," much to Geyer's pleasure. Kelsey remained in the employ of the Hudson's Bay Company until 1722 as a trader, mariner, and administrator. He served not only at York Factory but also on James Bay and the east coast of Hudson Bay. In 1718 he was named governor of all Hudson's Bay Company posts on the bay. He was recalled to England in 1722 and died in London in 1724. During his years with the Hudson's Bay Company Kelsey made several trips back to England, two of them when he had the misfortune to be taken by the French when they captured and then recaptured York Factory. In 1698 he married Elizabeth Dix of East Greenwich. The couple had two daughters and a son. In 1926 a Major A. F. Dobbs of Carrickfergus presented to the Public Record Office of Northern Ireland a collection of papers, among them a manuscript volume titled "Henry Kelsey his Book," now usually known as "The Kelsey Papers." This is thought to have come into the possession of the family in the time of Arthur Dobbs, a vigorous critic of the Hudson's Bay Company in the mid-1700s. The volume includes Kelsey's journals of his 1690– 92 expedition and his 1689 journey to the Barren Lands, as well as his account of some of the customs and religious practices of the Plains Indians. Kelsey also wrote a Cree vocabulary, published by the Hudson's Bay Company and long thought to have been lost, until it was identified in the 1970s among the holdings of the British Library. It is for what he saw that Kelsey is remembered. We think of him as a man privileged to have seen the Northern Plains and their peoples as they once were. Yet we should also acknowledge that he traveled not primarily as a recorder and observer but as a trader, devoted to the interests of England and the Hudson's Bay Company. He came to the Plains to change what he saw even as he was seeing it. See also INDUSTRY: Hudson's Bay Company. Davies, K. G. "Henry Kelsey." Dictionary of Canadian Biography 2 (1969): 307–15. Epp, Henry, ed. 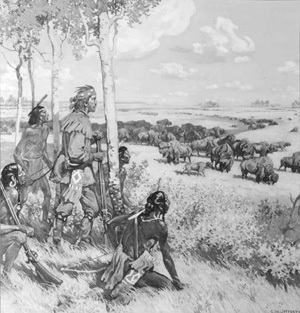 Three Hundred Prairie Years: Henry Kelsey's "Inland Country of Good Report." Regina: Canadian Plains Research Center, 1993. Warkentin, John. The Kelsey Papers. Regina: Canadian Plains Research Center, 1994.